It seems like hardly a day passes without news from Instagram. The latest numbers show that the image-sharing network, along with its parent social network Facebook, takes the top spot for most time spent in a mobile app in the US. And with the announcement of Instagram for the Apple Watch, it looks like the photo social network may soon be the hottest app on your wrist, as well as in the palm of your hand. With its ever-growing active user base and advertising program, Instagram is no longer the funky vintage photo app for editing selfies, but a robust photo editing and sharing network essential for online marketers. Instagram’s new app features remove many of the third-party editing needs, taking their in-app time back from VSCO and other popular software used to process images before they got uploaded to Instagram. In case you missed the news, we’ll fill you in on every major Instagram update in the past six months, and how they affect your brand’s presence on the network. In December, Instagram gave their devoted users an early Christmas present: five new filters—Slumber, Crema, Ludwig, Aden and Perpetua—the first update to Instagram’s filter collection since Mayfair and Willow in 2012. Two weeks ago, Lark, Reyes and Juno filters were added to the network, along with a promise of more regular filter updates coming in the future months. Unlike many of their predecessors, new filters introduce subtle changes to the photo, such as slight tweaks to contrast, brightness, or colour balance. Tech writers interpreted this strategy change as an answer to strong competition from editor apps such as VSCO, as well as advancements in smartphone camera technology in the past two years. This also indicates a shift in the meaning of a successful Instagram presence: nowadays, popular Instagram profiles often use the same filter for most photos, and use careful composition and colour schemes to maintain a consistent presence (if you want to learn more about ways to get Insta-famous, we described a few tips). Long gone are the days of funky vintage borders and sepia tones: with the advances in smartphone photography, now the quality and colour balance of the image is key to getting those coveted hearts. 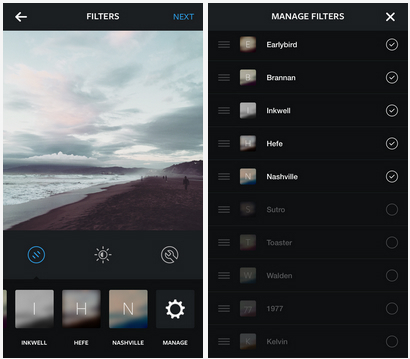 In addition to new filter options, Instagram has updated the way the filters are displayed in the app. While this isn’t as drastic of a change, it can be a big time-saver for those of us who have Instagram as one of many social networks to manage in a single day. 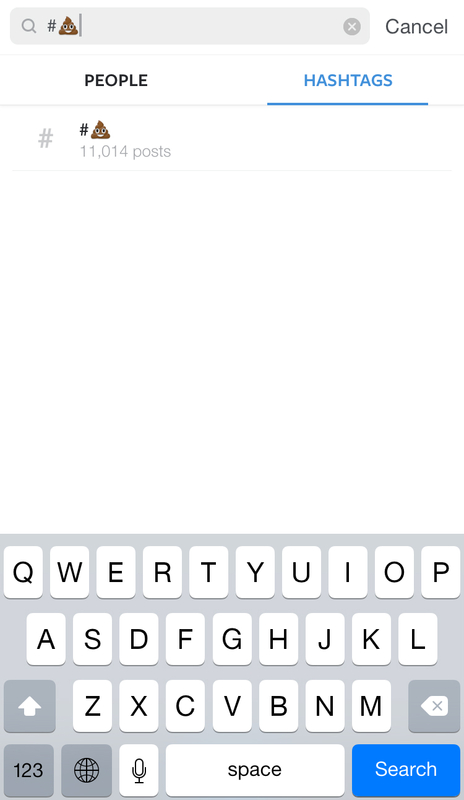 First, the new Instagram design allows you to preview the way the uploaded image will look with each filter. The December update had blurred previews that mainly showed off colour balance and contrast, and the newest update allows you to see the effects in greater detail. You can also adjust how strong of a filtered effect you want, by dragging the cursor on the selected filter. The December update also launched a new option to manage filters (the cog icon at the very end of the filtering options). Using this function, you can reorganize the way filters appear in your editing screen, to put the most commonly used ones first, and move the ones you don’t need further back, or remove all the unnecessary ones completely. Editing options on Instagram no longer stop at filters, either: now, you can adjust brightness, contrast, colour temperature, and other settings that affect how your images look—even if they’re post with #nofilter. These options are a great way to make up for a lack of professional photography training and any smartphone camera deficiencies on your brand’s part: darker images can be lightened, blurry images can be sharpened, and any inaccurate representations of colour adjusted. Photo collages are a popular type of Instagram uploads that used to require a third-party app to put multiple images together. 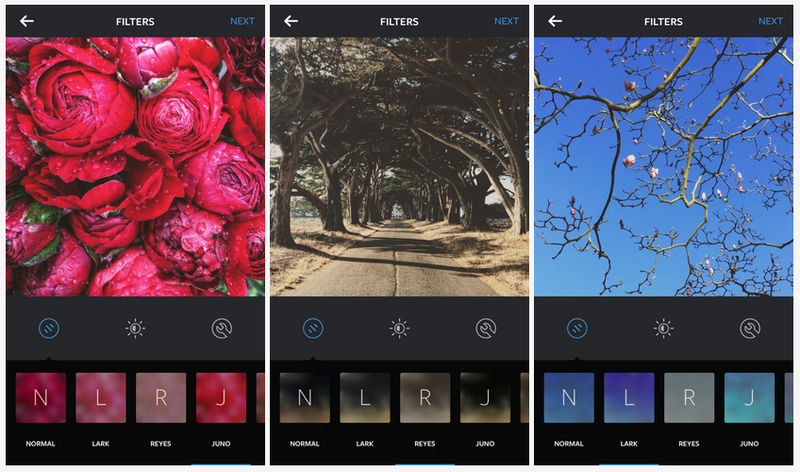 This need opened the market for a number of apps—Instacollage, Picstitch, Diptic, to name a few—before Instagram launched its own dedicated standalone collage tool, Layout for Instagram, in late March. 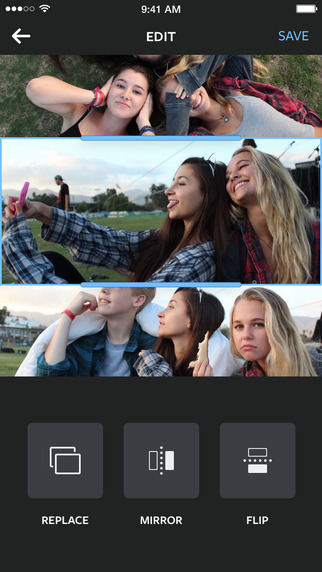 Layout for Instagram offers multiple options for combining several images into one, as well as a Photobooth functionality that lets users take bursts of photos and edit them directly in the app. Since many collages consist of photos of people, Layout for Instagram includes a Faces option, which filters out any images on the user’s camera roll that feature people. The release of Layout for Instagram app is great news for those times when you have too many good photos not to share all at once, but keep in mind Instagram’s best practices when you put together a collage. Stick to your account’s theme, and remember the basic rules of composition. Ask yourself if images belong together in a collage, or serve their purpose better as separately posted photos—or perhaps a #TBT post. Finally, one of the most exciting parts of the latest Instagram update was the introduction of emoji hashtags. If hashtagging captions with emoticons seems an unlikely practice to you, consider this: one of Instagram’s software engineers was quoted saying that emojis account for nearly half of the text on the network. Instagram’s data includes captions, comments, and bio descriptions on the network. So now, if you wanted to pull up all Instagram posts tagged with a happy poo or a coffee emoji, you can do it in the same fashion as you would in a text search—by pairing the hashtag symbol with your emoji of choice. Now you can search up how many people tag their photos with Canadians’ favourite emoji—the happy poop. If you need a refresher on the cultural importance of emoji for online lives, we have discussed the rise of the emoji trend in September. 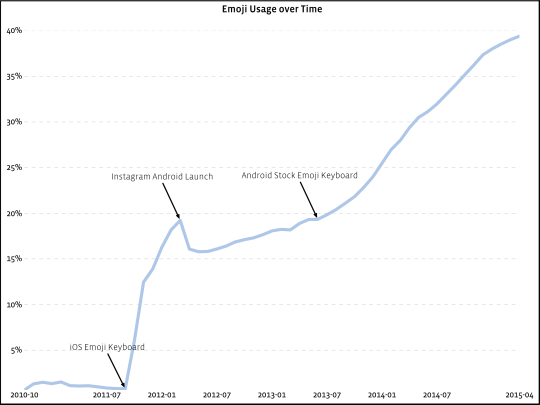 In fact, it might be a good idea to brush up on your emoticon skills—the Instagram engineering blog predicts that we may see a future where the majority of text on the network is made up of emojis. Did you know you can schedule and manage Instagram using Hootsuite? Try it free today.